[Originally posted on July 07, 2011] Do you feel safe lowering off a half-worn carabiner? No, neither do we. 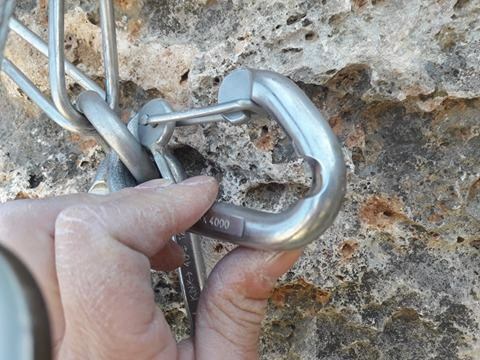 On Kalymnos, despite the best efforts to keep bolts and anchors in perfect shape, worn carabiners are a sign of overuse. Climb after climb, after thousands of ascents bearing all the load, even the heaviest-duty hardware will show signs of wear. However—there is a very simple way to help prolong the life of Kalymnos lower-offs. See below. 1. Bring along an extra quickdraw. 2. When you reach the anchor, clip your extra quickdraw to the top bolt. 3. Lower from this quickdraw until you are ready to move on to the next climb. For example, if you are with a climbing party of four people and you are all trying this climb, the first climber clips the extra quickdraw to the top bolt at the anchor then lowers from it. The second and third climber also lower from the quickdraw. The fourth (final) climber clips the actual lower-off, removes the extra quickdraw, then strips the rest of the route while lowering. 1. Bring along an extra short quickdraw or screwgate carabiner. 2. Place the quickdraw or screwgate carabiner on the bolt of the anchor in addition to clipping your rope through the fixed carabiner. 3. When you finish top-roping the route, the last climber in your party removes the quickdraw (making sure not to unclip the rope from the anchor!) and lowers from the permanent carabiner(s). Lastly, if your lower-off is a V-type with two carabiners, always clip always clip both carabiners. This takes some of the load off the fixed carabiners at the anchor. If we all make this part of our regular climbing routine and point it out to unaware climbers as well, thousands of ascents later it will have made a huge difference towards the safety and maintenance of routes (both more important than ever as the number of routes on Kalymnos has exceeded 1800 3500). If you haven’t already been doing this, please start next time you climb. It is best practice and it’s the simplest of ways to show respect and appreciation for the island, the equippers, and the volunteers working hard to keep everybody safe.